To each of you for all your hard work and dedication! This one-day home makeover for Bella was necessary and successful, but it was also a long one, completing it by 10:45pm. The family was beside themselves with joy. Bella was speechless and we all could tell that her bedroom was going to be a constant and a safe haven in her ever-changing life. Honestly, she was like a five-year-old seeing all the toys under the Christmas tree for the first time…adorable and so touching! 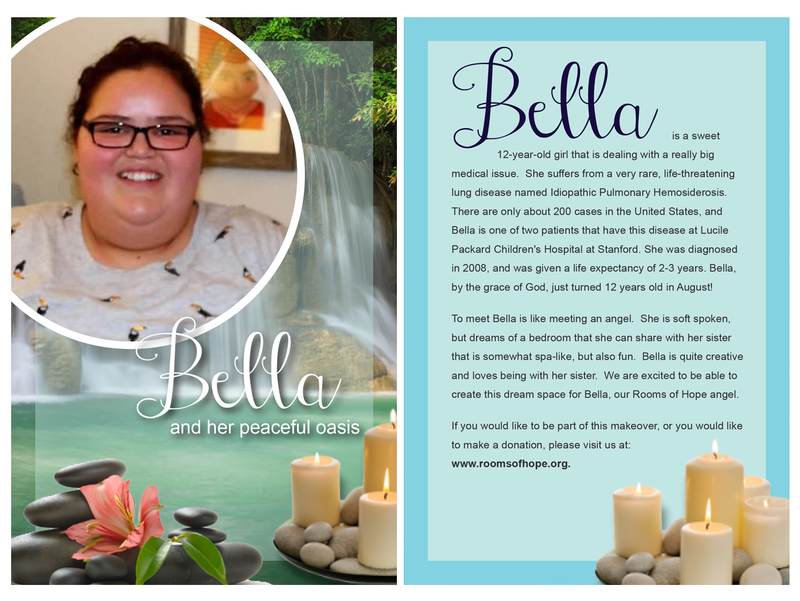 She said about her room, something to the effect like, “I tried to keep my expectations low because I didn’t think this could happen to me.” Bella has had so many disappointments in her short life that she doesn’t dare dream of anything big. It was said to her later to never stop dreaming, hoping and believing. Even the Fairmont Hotel hosted Bella at Christmastime, another dream come true for her and she’s worth it!!! To each of you…thank you for sharing your talents, treasure and love! Your contribution truly makes a difference for this young lady!